Mick Schumacher, son of the seven-time Formula One world champion Michael Schumacher, showed a dominant performance for the first time in his carrier. Mick Schumacher competes in the FIA Formula 3 Championship in 2018. As a support series for the German Touring Car Master DTM, the FIA F3 visited the legendary Nürburgring circuit this weekend. As usual, three races were held over the race weekend. Starting from the second position in the opening race, Mick Schumacher managed to take over the lead and hold on that, defending successfully from the hard-charging Robert Shvartzman and Daniel Ticktum. During the qualifying session held after the first race on Saturday afternoon, Schumacher set the best time to secure the pole position for the second race. With the grid for the final race is formed based on the second-best times, the 19-year-old claimed the pole position for the closing race of the weekend, as well. In both races, Schumacher made a good getaway at the start. Despite to a series of safety cars in the first race, Schumacher’s victory was never in doubt while in the third race, he pulled away from the competition in a commanding way. With his three victories out of three races, Mick made a jump to the second place in the overall standings and finds himself only three points adrift of Red Bull-backed Daniel Ticktum. Mick Schumacher took a turn for the better in the Spa round of the championship. Despite scoring two podium finishes over the twelve races of the first four race weekends, Mick started to excel in Belgium by claiming a fourth-place finish in the first race and winning the final race, his first ever in the FIA F3 series. He, then, went on to win the second race in the following race weekend at Silverstone and score another triumph in the next venue in Misano. 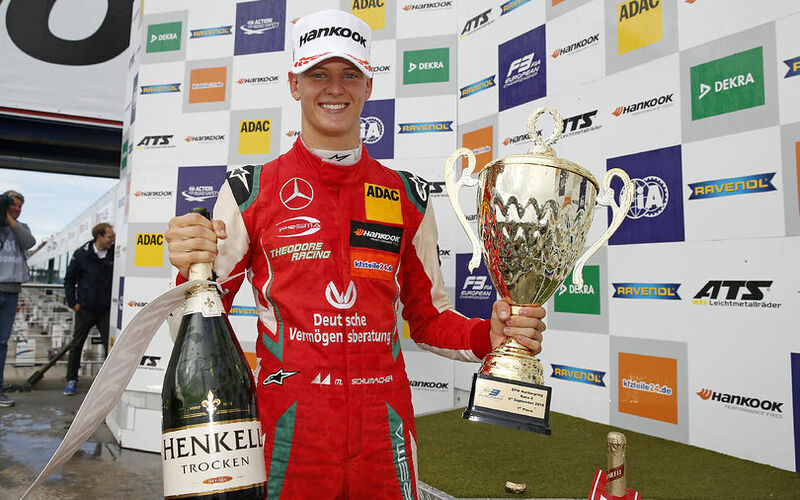 With his winning streak during this weekend’s Nürburgring round, Mick Schumacher revived his championship aspirations in his second season in the FIA F3 series. Schumacher started his motorsport career in 2008. To avoid attention because of his famous father, he started his career under the pseudonym 'Mick Betsch', using the maiden name of his mother. In 2015, he swapped his kart for a single-seater machine by joining the ADAC Formula 4 Championship. In the following year, he continued his development in that series, but also competed in the Italian Formula 4 Championship. However, while he drove for Van Amersfoort Racing in 2014, he joined the Perma Powerteam in 2015. He finished the year in both series in the second place. In 2017, he stepped up into the FIA Formula 3 European Championship. The first year proved to be tough for him and ended the season 12th in the overall standings. With his outstanding results at this weekend, Schumacher lies in the second place with two race weekends left, having scored a total of six victories, four pole positions, nine podiums and three fastest laps.